911uk.com - Porsche Forum : View topic - 997 gen 2 drive belt Tensioner failure . 911uk.com Forum Index > 997 (2004 - 2012) > 997 gen 2 drive belt Tensioner failure . 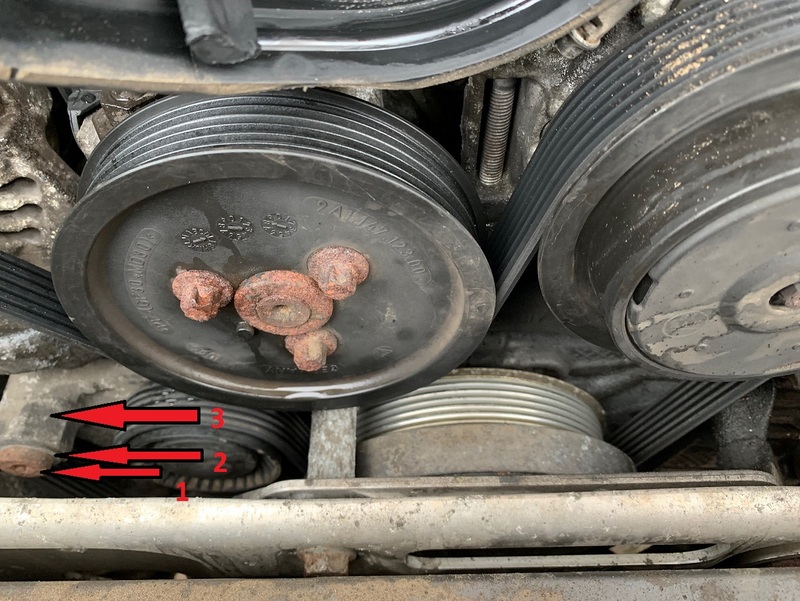 Posted: Sun Feb 03, 2019 8:34 pm Post subject: 997 gen 2 drive belt Tensioner failure . See the image below ..
No.1 . T50 bolt that locates it. No.2 the pivot , it looks like a washer but isnt .. its a pivot . No.3 the 30 or 32mm nut you adjust it with , i forget which size off hand. You move No 3 .. if the bolt moves then No.2 is siezed .. you need the top part of the tensioner replaceing . The lower damper only needs changeing if its leaking , again the roller pully is optional . Damage can occur if its left .. think of the bolt doing up or unwinding as it moves , and this is what happens .. 4k RPM and it lets go .. expensive . Its an easy check to prove as above . Just an advise as its a silly item that can be easily be over looked . Gratitude to Windy101 for the image . Right mouse click on the image and select view image for a larger picture . I would just like to add my sentiments to those many others have already expressed. deMort, you are a total gentleman and helpful beyond measure. I have managed to DIY this job with the help of advice from deMort and the following guides. Edited my original post to reflect the bolts are T50 .. no idea why i thought they were T30 .. getting old i guess ! !